Who could possibly convince a lawyer to close his firm for a day, an insurance company manager to use several days of his vacation, a park naturalist to reschedule all of his commitments, and a very busy retiree to drop everything and meet for a common cause? 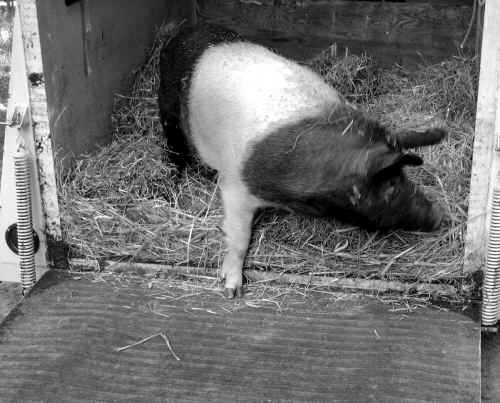 Penelope the pig, that’s who! We had some bread in the car and offered her a small treat, which certainly was inadequate to right the wrong that was being done to this sensitive creature. Each time that we visited this farm, we would bring cantaloupe, apples and bread for the prisoner in the dark dirty cell. Being incredibly intelligent, she began to recognize the sound of our car pulling into the driveway and grunted appreciatively. It didn’t take us long to discover that she was affectionate and she started coming to us to say hello, nuzzling us until we gave her a scratch on the chin and behind her ears, eagerly awaiting a short 10 minute reprieve from her loneliness. For whatever reasons, we humans tend to draw a charmed ring round ourselves, thinking that we the only ones with thoughts and feelings. Talk of animal sentience is usually brushed off as sappy and sentimental, not the stuff of science or the real world. We know otherwise! Penelope, as we named her, was trying to negotiate her life in a human-dominated and abusive world, in which she was a mere pawn for financial gain. The farmer was planning to slaughter her since she was no longer physically able to breed. It was time to help her get out of the darkness and filth and we needed a miracle to do it. Since she was “just a pig” it knew it may be hard to convince anyone to help us. After many hours of wracking our brains, a plan began to develop. Penelope would somehow be purchased from the farmer, a park naturalist became our “pig expert” and we started recruiting help. 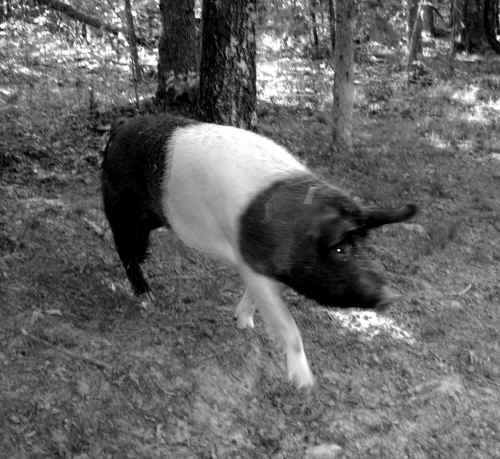 Finding Penelope a new home was not an easy task, but eventually we stumbled on The Pig Preserve in Tennessee, founded by Richard and Laura Hoyle in 2006. The farmer finally agreed to sell her to us but we had to move her right away. Of course, we came to learn that it wasn’t that easy! Penelope had to get permission from the U.S. Department of Agriculture before she could cross state lines on her way to Tennessee. An Amish Farmer in southern Lancaster County agreed to board her until she was ready to go. Now for the move! The Law Office of Tom Floyd closed it doors for a day; Steve Harter, a manager of Independence Blue Cross of Philadelphia put in a request for several days of vacation; Ted Groff, the park naturalist took the day off from work and from his own rescue operation; and Wanda Gunkel, a retiree with a very hectic schedule canceled all her appointments. They all met Grace and Phil of Animal Rescue at Penelope’s dark smelly prison and opened her door to sunshine and freedom for the first time. She took a few tentative steps outside, but quickly retreated back to the only home she ever knew. After much coaxing and convincing she walked from the muck to a bed of clean straw in the back of a waiting trailer. She rolled happily in the clean straw, brushing all of the dirt from her black and white body. After a layover of a week at the Amish farm, while she obtained her health certificate and approval from the Department of Agriculture, she was ready for her 14-hour drive to Tennessee. 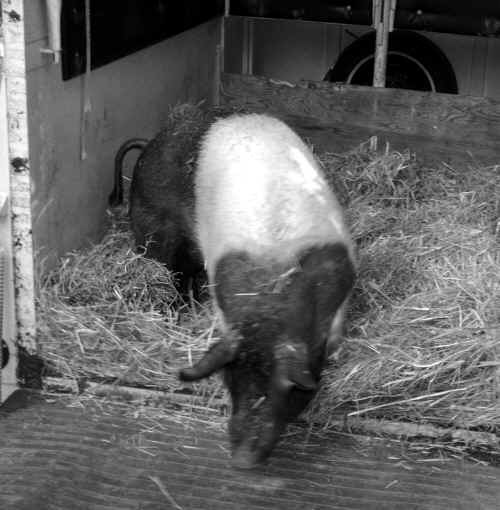 Phil from Animal Rescue and his co-pilot, Steve drove their happy passenger to The Pig Preserve, checking on her at rest stops and giving regular treats and reassurance. Upon arrival at the sanctuary, Penelope seemed surprised that the world could be so wonderful. The simple feeling of sunshine on her nose while she lifted her face to the sky, the feeling of grass under her feet, freedom to roam the woods and pastures, a roll in a mud next to the pond; Penelope was in heaven. Watching her kick up her heels and play like a puppy was enough thanks to all of us. Be happy Penelope. You’ll never be anyone’s dinner. Yes, your life is important! If you could see or feel the suffering you wouldn't think twice. Give back life. Don't eat meat.